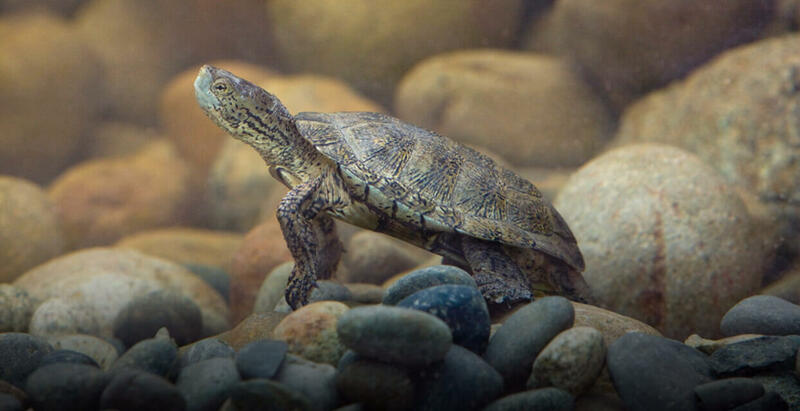 The Pacific pond turtle (or Western pond turtle) is the only native species of aquatic turtle in the state of California, where it is considered to be a Species of Special Concern. Recent taxonomic studies have revealed two distinct northern and southern populations, both of which merit conservation attention. Our partners have documented local extinctions or greatly reduced numbers in both populations, with no evidence of recruitment of young turtles. Invasive species such as bass, trout, bullfrogs, and non-native turtles are believed to be playing a large role in the decline of pond turtles, along with ongoing habitat loss throughout coastal regions. Additional threats include disease concerns in northern populations, and continuing drought conditions in southern populations. Partner zoos accredited by the Association of Zoos and Aquariums (AZA) have been working to conserve the Pacific pond turtle for a number of years. In the Pacific Northwest, the Woodland Park Zoo has been headstarting pond turtles and releasing them back into the wild for many years. This species has been designated by AZA as S.A.F.E. (Saving Animals From Extinction) focal species. Although pond turtle habitat differs in the northern and southern programs, both share similar issues of habitat loss and degradation and invasive species and there is much opportunity for collaboration. At the San Diego Zoo, our Reptile Department displays a number of pond turtles at the Elephant Odyssey exhibit. Because we do not have good data on their origins, they currently serve as ambassadors, playing a vital role in educating our guests on the plight of pond turtles and what is being done to save them. The San Diego Zoo’s Reptile Department is currently rearing hatchling pond turtles for eventual reintroduction to Sycuan Peak Ecological Reserve in San Diego. The turtles are cared for until they reach a less vulnerable size and can safely be returned to the wild. Our partners continue to track the released turtles to document the success of the headstarting effort. Moving forward, it is essential that headstarting be combined with invasive species eradication and habitat protection in order to achieve full recovery of pond turtles in our region.